Pastor of The Crossing Church in Tampa, Florida since March of 2005, when The Pointe Church and Crosstown Community Church merged, each having over 1000 congregants, to form one body. Currently over 5,500 attend weekly at three campuses. 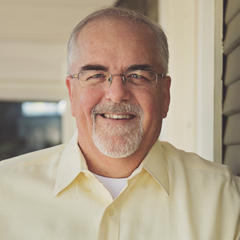 His education includes a Bachelor of Education with a Minor in Science from the University of Missouri, and a Masters of Divinity with an Emphasis in Church Planting from Southwestern Baptist Theological Seminary. Pastor Dumas is an evangelist, national speaker, and local radio personality. He supports Tampa Bay’s Community Issues Council and The Hillsborough County Community Action Council, which have both been instrumental in influencing local and regional school and county government. Nationally he is a member of The Black Robe Regiment, The Champions Network, The North American Mission Board, The Association of Related Churches and Select National Pastors Association. His personal desire is to see people grow in their spiritual maturity, through reading the Bible, Prayer, Journaling, experiencing life together through LifeGroups and encountering personal Freedom from the Lord daily is contagious to all. Pastor Greg Dumas and his wife Tamara have been married for 24 years and have been blessed with three children. They have two children living at home, Lainey and Zeke, and their oldest daughter, Toree, married Trent Anderson in June 2015. Kelly has been a member of The Crossing Church since 2015, where she served in several ministries including Crossing Kids, Pastoral Care, Benevolence, Sisterhood, and 1st Impressions, prior to being led to the calling at The Crossing Bible College. Her education includes a Bachelors of Arts in Business Management with a minor in psychology and a Masters of Arts in Human Services Counseling with an emphasis in Christian Ministries from Liberty University. Kelly has a passion for education and learning. She especially desires to help adults build their foundational knowledge of Jesus Christ and understand biblical principles, to become equipped for ministry. She also has a passion for helping people build their confidence in praying for others, and having the knowledge to lead difficult conversations with believers and non-believers or skeptics alike. She enjoys helping others achieve their goals and wants to motivate people to never give up, even through adversity. Kelly hopes to inspire others to trust in the Lord's plan and follow through on the journey He leads us to. Mrs. Timmer shares her life with her husband of 6 years Reggie and together they have been blessed with 2 sons, Silas and Ezekiel. They enjoy going to amusement parks, the beach and attending "foodie events" as a family.